Day 3 of Atlanta Game Fest 25 saw me playing some old favorites that I usually only get to play at AGF, as well as, learning a few new games. Old: Expedition and Circus Flochati. New: La Isla, another new Stefan Feld title; Planes; and Pandemic: The Cure. I also got in a second play of Istanbul, this time teaching it, and finally got to play the 2nd Tier Extended Board of Tuscany. That was super fun! It totally changes the game of Viticulture. On to the games. 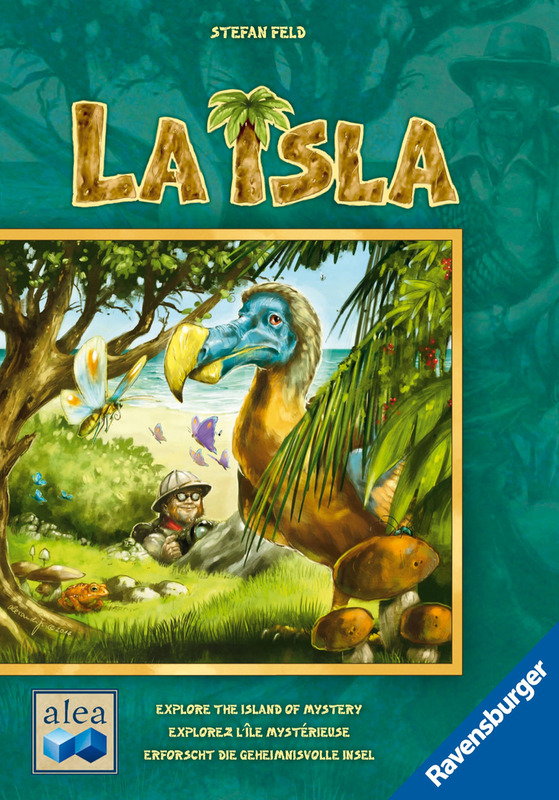 La Isla is a new Stefan Feld release, with players exploring a jungle area in pursuit of rare specimens – animals long thought extinct, including the Dodo Bird, . The game board of La Isla is made up of oddly shaped tiles that are placed in a circular arrangement around a central polygonal tile. 35 animal tokens (7 in each of 5 types) are placed randomly on spaces numbered 2-4 on the game board; these numbers equal the number of camps that surround the spaces. Each turn players take three cards and place assign them face down to the A, B, and D spaces of their card displays. When everyone is ready, players all reveal their A card, then place it in one of the three slots at the top of their display. Initially, each new card will add a new power, but eventually, you’ll have to cover up an existing card, thus losing its ability and replace it with a new one. Powers include being able to treat all cubes of a particular color as wild, bonuses for placing your scientist on a particular color or type of space and numerous other options. Once all players have placed their A cards, they revealing their B cards simultaneously and collect the good depicted in the lower-left corner if their card. For Phase C, each player, in turn, places (or moves) one of her scientists on a camp, paying two resources of the color depicted on it. If this placement results in the player having a scientist on all of the camps surrounding a particular animal space, she has captured the animal and takes the tile, scoring points for it accordingly. It is possible to capture more than one animal at a time. If you don’t have the resources necessary to place a scientist, you can simply take a cube. Finally, after all players have placed a scientist, they simultaneously reveal their D card and increase the value of the animal depicted in the lower right corner. Play continues in this way until the total value of animals on the animal value board reaches a certain point: 11 for 4 players. Players then add the value of the animals they captured, earning bonuses for acquiring complete sets – one of each of the five animals. The player with the most points wins. La Isla felt very abstract to me – I’m not sure why. Later in the game, I often found it hard to choose which card’s ability to lose. Many times I wanted to keep what I had rather than replace something. The feeling didn’t last long, however, because the game is over before you know it, making it a quick filler. I can’t remember ever describing a Feld game as a quick filler before. While looking for a short game I could play until Tim’s game was over and we could go eat, I was invited to play Planes. 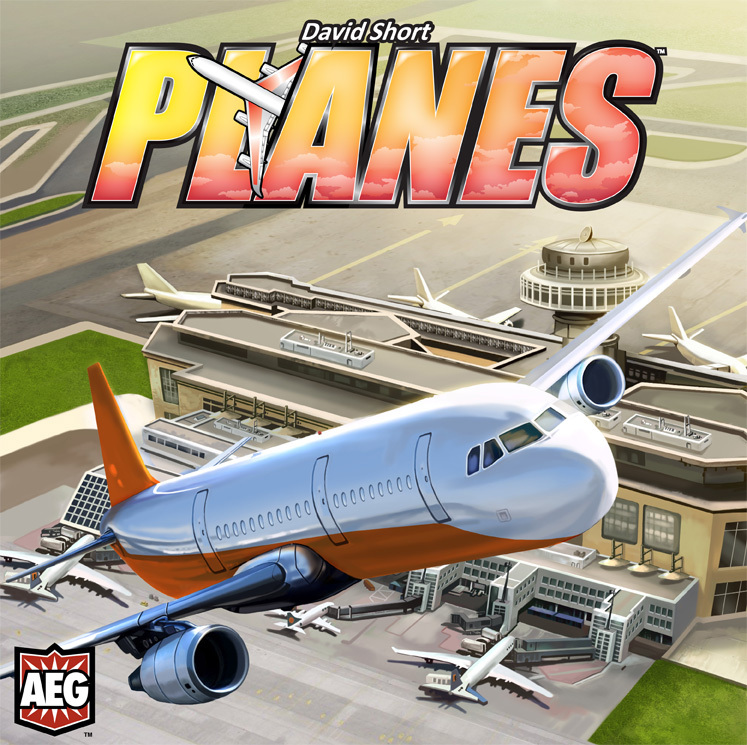 Planes is a modern Mancala game with players moving passengers, in the form of colored cubes, around an airport. On your turn you can optionally play a card from your hand to perform a special action – everyone begins the game with 3 cards, when you have none or complete a goal you get another – then pick up all of the cubes on a space and distribute them one space at a time just like in Mancala, but with one exception. You can choose to stop whenever you want, dropping the rest of the cubes on the ending space. If you’ve completed the goal on one of the cards in your hand, play it face up and take a new card. Each card has an action on the top and a goal on the bottom. When played as a goal, it scores you victory points (VPs). Goals run the gamut such as having at least one of your cubes at a Fast Food Restaurant or Gift Shop or some particular color combination on a space on the board – some board spaces are marked with icons representing Fast Food Restaurants, Fine Dining, Gift Shops, Restrooms and other places typically found in airports. In Planes, you can also acquire VPs by loading your passengers onto your planes. Whenever you load a neutral passenger onto a black plane, you get two cards. Play continues until a certain number of passengers have boarded planes. Planes is pretty easy to learn – most people have played Mancala at least once – so you can start playing almost immediately. Play time is usually short, but can get longer if players are particularly vigilant about not leaving easy boarding plays available to their opponents. This happened in our game. It was still pretty fun, but Planes isn’t a game I’m going to be clamoring to play all the time. Nor do I feel I must own it. Your mileage may vary. I was really excited to find an open copy of Pandemic: The Cure on the wall of games. Tim and I decided to read the rules and run through a game while we ate dinner one night, then were joined by two more players. Sadly, we did not save the world: time ran out on us. Pandemic: The Cure is a dice game version of the classic cooperative board game Pandemic with players rolling dice to determine what actions they can take on a turn. You can reroll any and all of your dice as many times as you want, hoping to get the particular actions you want, but there’s a risk: you can’t re-roll bio-hazard symbols. Every time you roll one, you immediately advance the infection rate, which could also lead to an epidemic. Epidemics are bad. In Pandemic: The Cure, your goal is the same as in the board game: find the cure for the four diseases that threaten the world – it’s the only way to win. As in Pandemic, there are multiple ways to lose: too many outbreaks, the infection rate spins out of control, etc. The dice for each role are different: each role has its own specialty. Players should try to take full advantage of their specializations to improve their chances of winning – just like in the board game. Possible actions all roles can perform include: flying or sailing between the six major population centers of the world, treating disease in your current region, and collecting samples for further study. Some roles have their own special actions as well. Each turn, you can also exchange knowledge (share samples) with players in the same region as you and roll those sample dice in an attempt to discover the cure. I think this is where we failed: we should’ve passed the samples around so we could roll for the cures more often. We spent too much time treating the diseases and trying to keep them under control and avoid outbreaks and did not concentrate enough on finding cures. 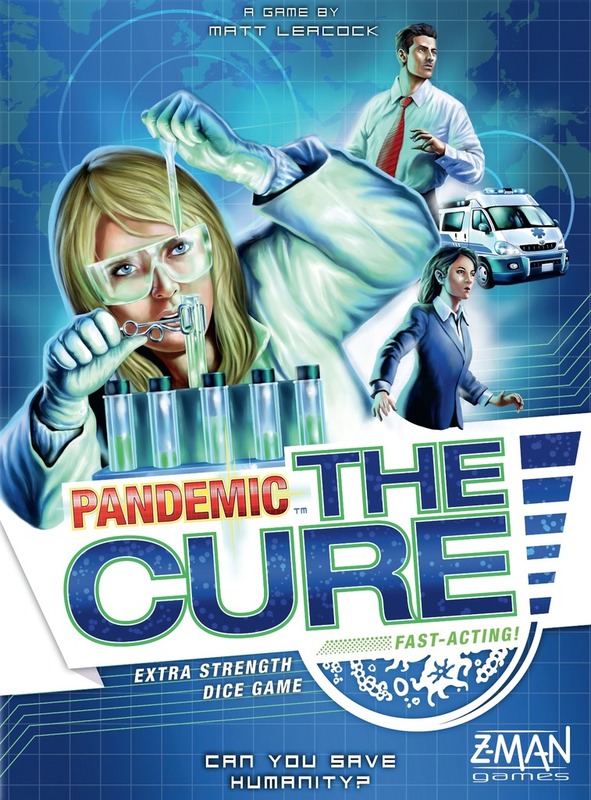 I look forward to playing Pandemic: The Cure again soon. I still love co-ops! I really enjoyed our play of Viticulture using the Tuscany Tier 2 Extended Board that features four seasons of actions instead of two. It really was a game changer: felt almost like a whole new game. Instead of covering it here, I’ll discuss it in its own article. Look for Uncorking Tuscany: Tier 2 coming soon.